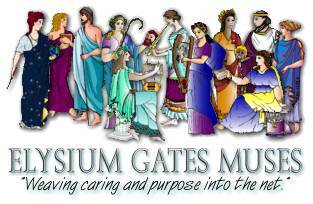 Welcome to Muse Calliope's page and Symposium! Each area of Elysium Gates. Inc. has a Muse that coordinates the activities and volunteers of that area. Muses are primarily responsible for generating contests, awards, and activities to promote the Area's Charitable Project. Muses are great organizers and instigators. If you have an idea that needs to be put in action they are the volunteers to contact. The Muse position of Symposium is currently held by a wonderful woman who has a long history of volunteerism on the net. She looks forward to hearing from you and developing more great activities for members. Write her anytime at musecalliope@elysiumgates.com Be sure to visit her page she wrote about the historical Muse Calliope and what she does here as a volunteer. Also please visit her personal web site to find out more about her interests!